The Oregon Department of Education (ODE) announced today that all Oregon schools will use paper-and-pencil assessment tests in math and reading for the remainder of the 2006-07 school year. This action is necessary because ODE's contractor for TESA, Vantage Learning, has declined to continue performing services required under the contract. ODE exhausted every option to continue with TESA until the end of the school year. ODE is working with the Oregon Department of Justice to explore its legal options. Below is a screen grab of what you find if you visit the TESA page. The page that schools used to log into the system for testing. 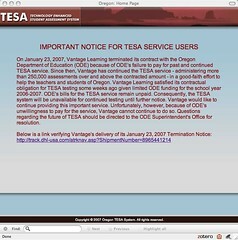 By the way as of this posting, Vantage Learning still notes TESA and the work they did for the Oregon Department of Education as one of their "Success Stories".... From where I'm sitting, thinking of administering paper pencil tests to my students, it sure does not sound like one.